From fixing loose shingles, to building foundations or sealing leaks, roofers have a lot to handle. And roofers like you make sure it’s all done right. Whether you’re an expert at fixing or replacing roofs, it takes both knowledge and skill to call yourself a roofer. But in addition to your skills as a roofer, you’re also running a business. As a busy professional, you need general liability insurance for roofers so that you can focus on your work, with the confidence of solid coverage behind you. You need roofing contractors liability insurance that’s going to be easy to deal with, and fit within your budget, no matter what size your business is today, or what it becomes tomorrow. And that’s exactly what you get when you buy insurance from Next Insurance. Our roofer liability insurance policies are simple to buy, online, anytime you’re ready. They’re exceptionally affordable. And they don’t include extra roofing business insurance you don’t need, and don’t want to pay for. They’re tailored to you and exactly what you do, and where you do it. Get a quote now, and see for yourself how our insurance for roofers could be right for you and your business. Why Do I Need Roofing Insurance? Roofing insurance is a must for any professional who’s serious about being safe. Whether you’re putting down shingles, or putting on a whole new roof, liability insurance for roofing is an essential foundation for keeping your business productive and safe. There’s just no getting around the fact that fixing and replacing roofs can be dangerous. Many customers know that, and will demand roofer liability insurance, backed by a certificate of insurance, just to allow you to bid on their job. That’s because they know that accidents can happen; whether they trip over your toolbox while coming to check out your work, or one of your workers accidentally damages their hardwood floor walking through their house. So give customers what they want, and get what you need: liability insurance for roofers. While everyone hopes everything will go as planned, with the right roofing contractor insurance in place, you can worry less and work more – focusing on building your business, and getting the job done. Why Is Next Insurance Right for My Liability Insurance for Roofing? When you’re choosing between roofing insurance companies, you’re looking to save time and money. With Next Insurance, you can purchase your roofer liability insurance directly online in just minutes, without the hassle of hunting down an agent or waiting for a roofing company insurance quote. Instead, you choose one of our plans, according to your business needs, with no unwanted extras or hidden fees. Pay up front, or choose a monthly plan, it’s up to you, at no added cost. Plus, you can add customers as an additional insured or download a certificate of insurance for free, online at any time you want. It’s commercial roofing insurance that’s easy, it’s efficient and it’s fair. Take a look at our reviews to see what other professionals have to say about our roofing liability insurance. Is Business Insurance for Roofing the Right Policy? What if I Do Other Work? It’s possible that like many roofers, you do work other than roofing. 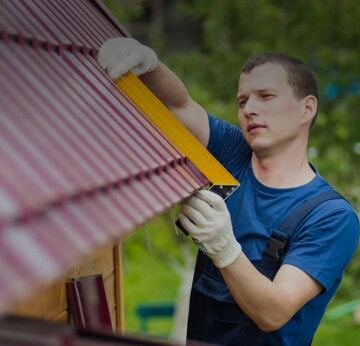 From fixing stairs and fences to cleaning up yards or painting, you might need insurance for a roofing company that goes beyond just roofing. If this sounds familiar, we suggest filling out our general contractor insurance application. Make sure to check off all the activities you do, so we include coverage for them. If something you do isn’t on our list, it’s simply an activity we don’t cover at this time. Get the insurance for roofing contractors that you need to thrive. Get covered in minutes, with no meetings, phone calls or faxes required. Go ahead, fill out our quick online application to get your quote, and choose the roofing insurance that's right for your business. You can get back to growing your business, knowing that you've got serious, professional roofing insurance behind you. Roofing License Requirements Guide – How to Get a Roofing License?